One of my areas of focus is the security in embedded computing. About more then a year ago I visited the "Embedded World 1016" in Nurenberg, Germany, probably the biggest trade show in the world focused on embedded computing. One of my major goals for the visit of that year embeddd world trade show was to investigate what this industry has to say about security in embedded computing. With the exception of 2 persons, nobody had an idea about what I was talking about. Today security in embedded computing is in everyone head. My area of preferences is around the "TrustedZone" concept of ARM, now implemented in their 8th ARM architecture and in the ARM Cortex M 23 and 33. So as you get a lot of information about this at the ARM site, finding providers that have implemented the IP of their Cortex M23 and 33 has proven very scarce. Having worked for Motorola Semiconductor for a decade here in Germany I did look into the product announced, the i.MX8 family of controllers. 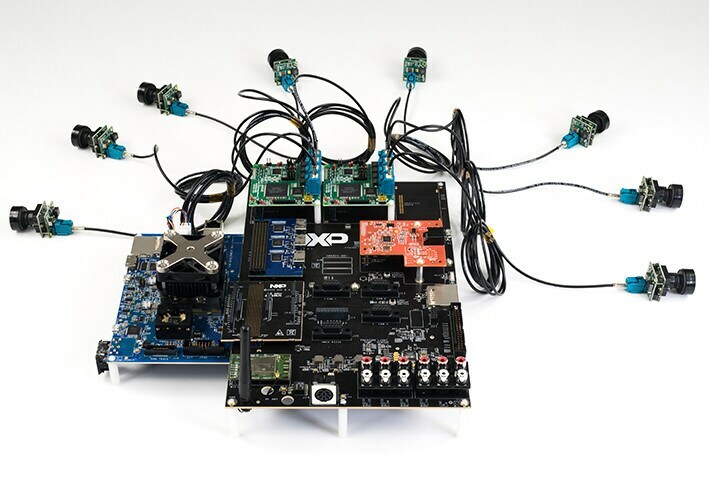 This controller is aiming the automotive marketplace, but providers of inexpensive boards are announcing products that use members of the i.Mx8 family. Trying to understand why this products have been announced starting a couple of years ago, but those i.MX 8 controllers have yet not been released to the general market. Knowing Motorola pretty well, they came out with the first processor dedicated to DSL communication, I started to investigate why this delay. Now, its interesting to add to the background when dealing with this investigation of mine, what the semiconductor experts say about the future devices challenges. I remember that while working for Motorola 2 decades ago in an internal briefing we got interesting information! The ever decreasing size of the structures used in silicon, devices have practically all become "pad limited", opposed to "core limitation" that was predominant earlier. To say it in simple words: It becoming a challenge to integrate functionality into a chip that fills its core space. The number of IOs and other pin functionality required by the designs forces chip designers to use chip sizes big enough to allow for all those pins. Already then we were told that implementing multiple cores in a chip was the way to take advantage of the available core sizes. Also, increasing the frequency of the clocks for the chips was getting to limits due to the heat generated and the need to diffuse it. We have seen the impact of this. processors have multiple cores and controllers have multiple cores of the same kind and/or multiple kind of cores. The i.MX8 device family is to my believe the most sophisticated realization on the market. But, by doing so, a new kind of challenge appears. Here a link to a board from NXP that allows to work with all functionalities included in the i.MX 8 devices. This link can be your starting point into investigating the device family. Here a second link that lists what this device family is able to deliver! The list of functionality in the biggest device of the product family makes evident a challenge that NXP faces to make the device available to the general market! What is not a problem for customers being big corporations, is a problem for the "Makers" community and smaller companies: The functionalities available in the device require expert engineers in a wide variety of expertise. Audio, Graphics, GPU usage i.e. not just to analyze the inputs from 8 cameras around a car and for embedded ARM Cortex devices and ARM processors. If NXP would make this product to early available for the general market this technical challenges would jeopardize the opinion in the market for this device. The automotive players do have the expert teams in the areas required and the organizational challenges to manage such set of expert teams. As this is the first and main focus to the introduction of this product and the volumes possible there are big enough to justify the support required for this product. But know I am seeing developments that will help to make the use of such a device. There is an effort to create a special Linux implementation that already support about 90% of the functionality required to use the on-chip functionality and sets APis to take advantage of them. Here the link to the page of "Automotive Grade Linux". Efforts like this of AGL are prerequisite for "normal users" to be able to use such controllers. The i.MX 8 family of controllers is a very good example of how chip designers do benefit and fill the plenty of silicon space available within a chip. The same device family also implements the TrustedZone concept in a very sophisticated way. You have probably all heard about how dependent modern cars and even more future autonomous cars are of being able to run a plethora of applications and operating systems and being confident that a crash i.e. in the entertainment application does not affect other environments in the car. Neither functionality wise nor safety wise! Finally on the trade show Embedded World 2018 the first board will be presented from board makers. Variscite has an i.mx8M board available starting from 67 USD!